At CMV Group, our 'Three Peaks' policy is the culture of placing equal importance on employees, customers and our community. 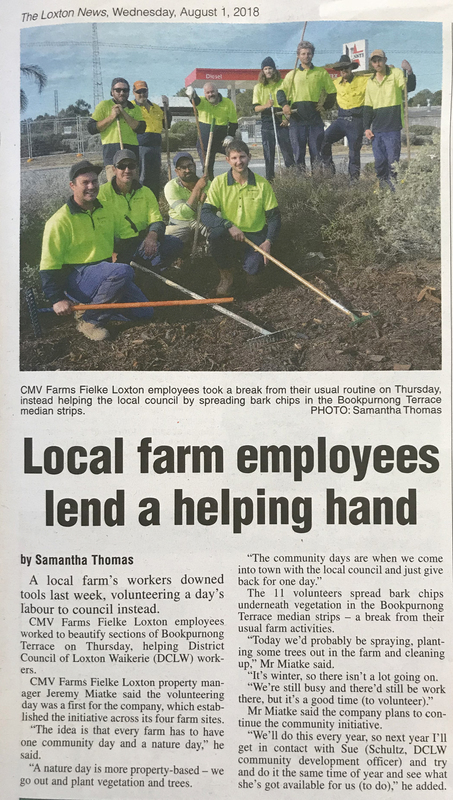 In true community spirit, our CMV Farms 'Fielke's' team recently volunteered a day's labour to the local council. The team from this property, in Loxton SA, stopped their property work for the day and helped out the District Council of Loxton Waikerie by beautifying sections of Bookpurnong Terrace and spreading bark chips underneath vegetation in median strips. This is part of a CMV Farms initiative, where each property has a community day and a nature day each year. Well done to the Fielke's team! Read more in the article below from The Loxton News.